Today I am going to tantalise you with some detailed shots of my own bag before the big reveal later in the week! This first image shows the bottom right at the front of the bag. 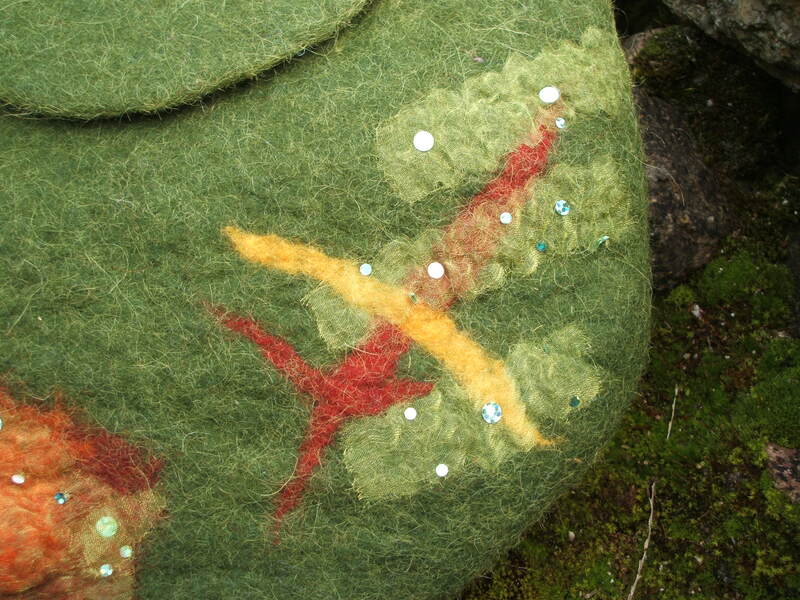 It is a bit difficult for me to photograph the surface detail accurately because in reality the fabric almost disapears into the felt and the glittery circles seem to float on the surface. I am actually going to have this piece photographed professionally by Bernie McCoy but until then these images will just have to do. The second shot is one of the details from the back. I had various round shaped pieces of resist between the layers, Lyda would have used bubble wrap as it is not so thick but I decided to use laminate floor underlay because I wanted to know exactly where the plastic was in order to add my surface decoration on top. When the bag was almost totally felted I opened up these areas and then worked on sealing the edges and in some cases inserting fishskin to add extra texture and interest. Within several of these ‘pockets’ I had positioned gold fabric under the resist and these areas now add an additional excitment to the finished bag, I feel that what you get is more than what you see at first glance. During the whole process I was using gorgeous soap made by my friend Anna Browne, olive oil with a light scent of orange. If you want the opportunity of trying out this special felting gem why not visit Anna’s blog and enter her current ‘castille soap’ giveaway? The last picture for today is from the flaps which are hidden when the bag is held in your hand. The only way you can see this surface is if you lift either flap, the bright colour and gold silk thread really adds a lively feel and an element of surprise. 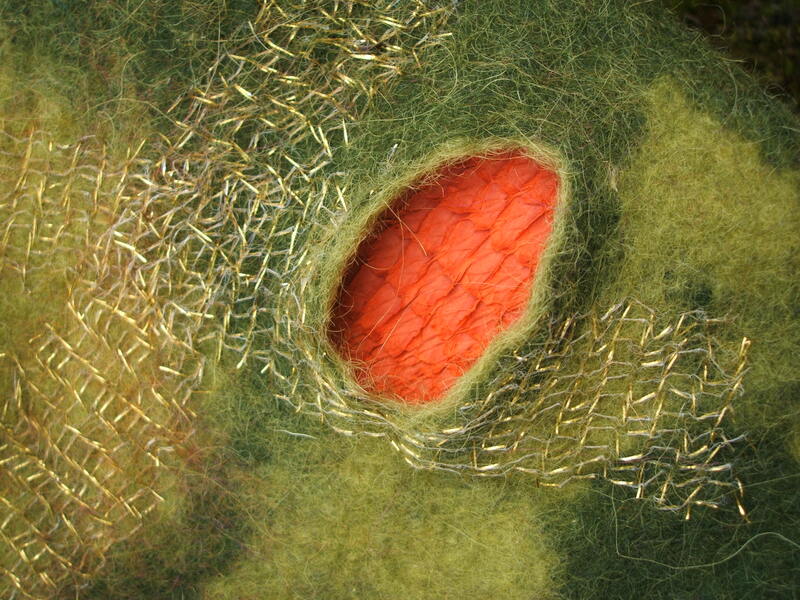 This entry was posted in Felt, workshops and tagged Anna Browne, artificial fabric, Felt, felt bag, Felting, felting soap, gold silk, wet felt, wet felting by Nicola. Bookmark the permalink. Unbelievable! Amazing! I can’t even think of any appropriate words to describe it – and your work in general. Wow……………cannot wait to see the whole project. As always your choice of colour is explosive and exciting. Can’t wait. Well, I can hardly wait for the big reveal. This is amazing! One question…Is that really fishskin? Amazing texture. Will be anxiously awaiting your next post. 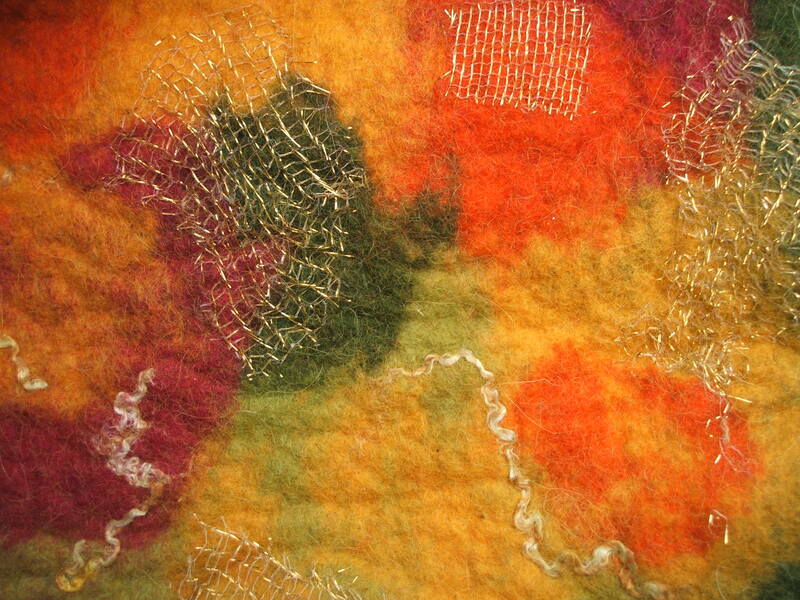 I am excited by all the secret inclusions and the texture and the mixed media elements. Thank you for all your posts…They are educational and inspiring. You are on a journey with wool as the landscape. This is very inspiring and exciting I love your use of colour and textures ….waiting with anticipation for your next post.